As I mentioned yesterday, the DC May 2104 solicits are posted, and we have this offering: Earth-2 Hawkgirl! Kendra Saunders comes equipped with her pistol, and it looks like a working holster for it as well. In her left hand, she appears to be holding her combat knife, but it is hard to see as the tip is pointing right at the camera. The giveaway: the sheath on her right boot. Her long ponytail is off to the side in the solicit image, but it's unclear what kind of articulation it has, if any. It may just be on a ball joint in the back of her head, but if it was up to me I would make it a bendy piece. The blue and black look nice, and the wings retain the angelic quality and coloring from when Nicola Scott first drew her a couple of years back. The price is a bit steep compared to retail toys but these "adult collector" toys have been essentially at this price point for a while. Trust me, the price of oil has really taken it's toll on the price of poly-plastics. Not sure if I will pick her up or not. I really like Kendra's new duds (the blue is such a twist from what one normally expects for a Hawk costume), but I have severely cut back my spending on toys... the $150 I dropped on X-Plus's vinyl Sanda and Gaira not withstanding. But I have to admit, she would look super sharp on my Hawkman shelf! 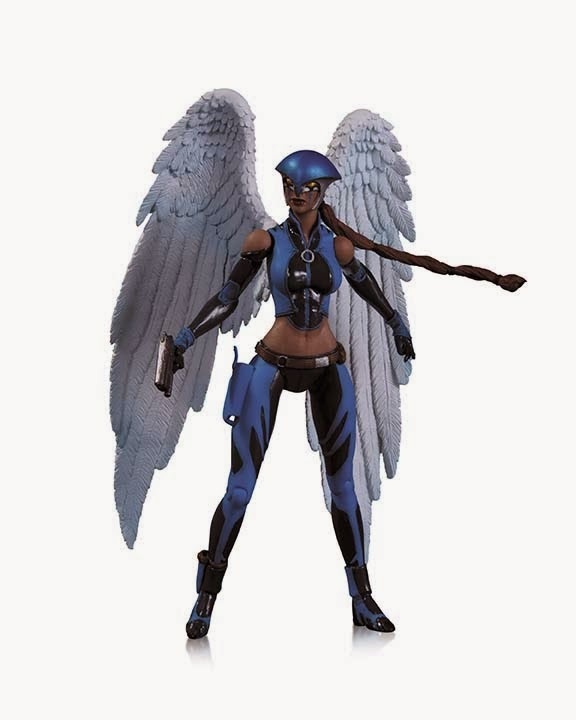 Image: New 52 Earth-2 Hawkgirl toy, 2014, DC via Newsarama. Alright, this is not really Hawk-related, but please bear with me and hear me out. I have been hearing for several years now how "DC made $3.99 the standard price point" for comics in this country. I have long pushed back on this, saying that DC generally (but not always, especially for miniseries) kept their standard length books at $2.99, whereas Marvel arbitrarily decided which books were $2.99 and which were $3.99. But this being the Internet, Marvel == Good; DC == Bad; so my cries fell on deaf ears. So with the May 2014 solicits for both Marvel and DC going live on Newsarama, I decided to do a little research. I'd get a count of how many books each publisher put out at each of the two price points. Maybe I was off base with my statements, and that was why no one was listening. Some hard numbers should make things clear. For reference, here are the solicitation lists I used -- Marvel, and DC. As I said, both are from Newsarama. As you can see, Marvel has far, far more titles at the $3.99 price point than DC does for the month of May 2014. But, I wanted to make sure I was comparing apples to apples, not apples to oranges. It's fair for a publisher to charge more for a title with more pages than standard. So maybe Marvel is releasing a lot of oversized books with extra material in them, which would explain the higher amount of $3.99 books. So I took a look at page counts. So, no, Marvel is not publishing appreciably more oversized comics than DC is. Pretty cut and dried, isn't it? Certainly seems that way to me. Now, I suspect that a lot of these higher price point comics from Marvel are priced that way because of the inclusion of the "free" digital codes in the books. At this point, the only series I read from Marvel is Iron Man (natch) (although that Nightcrawler book written by Chris Claremont is seriously tempting), and that series has been $3.99 with a digital code for a while. But here's the rub: I don't use those digital codes. I have redeemed a few of them, but at the end of the day I read my new comics physically, reserving my tablet for older comics, generally. So why can't Marvel give me a break, knock a buck off the price, and not include the code? Of course that will not happen. And in the interest of full disclosure, I get a discount through DCBS on every comic I buy (save for the odd one here and there I get from the LCS). But in today's market, every dollar and every cent really matters, and those start to add up really quickly. Now, none of this means anything from a quality standpoint. Please, read what you like and can afford to buy, and if you don't like what DC, Marvel, or any publisher is doing then make yourself heard. But I wanted to put these numbers out there and at least make everyone aware that this popularly held notion that DC is gouging readers is simply not borne out by the statistics. -- Obviously, these numbers are not looking at trade paperbacks, hardcovers, or other collected editions, nor toys and other collectibles. -- Both publishers have 9 titles at the $4.99 price point. All of these are either oversized (ranging from 40 pages to 64 pages) or a "combo pack" which includes a digital access code. -- Hawk-related: We're getting an New 52 Earth-2 Hawkgirl figure! More on this in later post. -- Showcase Presents: The Great Disaster is FINALLY getting released! Woo Woo Woo! You Know It! In an effort to actually, ya know, READ my Hawkman comics which have taken up seemingly permanent residence in a series of boxes in my bedroom, I finished up Volume 2 of Hawkman this past week. This is the book, you will remember which spun out of the Shadow War miniseries (see here, here, here, and here), and continued to address the quiet invasion of Earth by agents of Thanagar. At least, it does until Tony Isabella leaves after issue #9. Dan Mishkin was scripting over Isabella's plots, and he takes over writing chores proper in issue #11 (after a crossover with Action Comics). Normally this wouldn't be much of a problem, but Isabella leaves right in the middle of the blow-off of the entire Shadow War story, so the ending which has been building for over a year ends up being a little wonky in the grand scheme of things. Before he heads out, though, Isabella does some really neat stuff, including introducing the evil Wingman Deron Ved, AKA Dawkwing (no, not that Darkwing) as the leader of the invasion. Darkwing's schtick is that he was the first Wingman to earn the Honor Wings, with Katar Hol being the second. The running battles between him and the Hawks are very nicely done, and Richard Howell and Carlos Garzon make the art pop, despite it's somewhat tame "DC house style" finished look. Mishkin also turns in some cool story beats as well, including a council of Thanagarians using an android duplicate of Hyathis to rule from the sidelines, and a very Silver Age-y story where good portions of Thanagar are turned into giant monsters. And you folks know how I love giant monsters. But then everything sort of goes off the rails. The finale of the series shifts the action from Midway City to... New Orleans, I guess, although it is never spelled out. And in the wake of Katar and Shayera closing the book on their lives as Thanagarians, our hero becomes extremely unsure of himself: indecisive, irrational, and ineffective. There's a lot of stuff about ghosts, the Gentleman Ghost, and realms of the afterlife (where you are not, like, "dead dead," but maybe just "mostly dead") and the roiling storm in Hawkman's heart. And while Hawkman having a tortured, angry heart might fly for the modern rendition of the character, it doesn't ring true for this one. The last issue features a raging Hawkman essentially battling a hurricane, while Shayera and the Gentleman Ghost try to breach their way back into the world of the living. I can see what Mishkin was going for, but as essentially a capstone on the character before Hawkworld, it doesn't really work for me. Ultimately my feeling on this series was one of missed potential. I dug the Shadow War mini and thought that a series which really dug into that concept would be a lot of fun. And for a while, it did exactly that, and I had fun reading it. But it was clear that the sales were not there, and DC did some shake-ups, and in the end, it was too little too late. Katar and Shayera as we knew them were going to be on their way out; Hawkworld was looming, for good or ill.
And it looms for me too, for that is the next series on my Hawkman read-through. Maybe I'll even blog some about it. What do you think? The Shadow War Is Over... As Above, So Below. I finally got my copy of Forever Evil #5. Overall I am still really enjoying this series, but I have a petty sort of complaint which bugged me last issue, and really bothered me this issue. Lex's team runs into resistance from the Society in #4, and among the crew is the new Shadow Thief. Now, this alone is annoying, because the new Shadow Thief has not been shown to be a member of the Society, nor do her motivations suggest that she should be a member. Her whole MO is to hunt down aliens on Earth. She is not a thief in the same vein as Carl Sands was; she is called "thief" because she stole her shadow suit. But I let it slide, because maybe there is a reason she is working for the Society and we just haven't seen it yet. So then we get to issue #5, and the fight rages on. And what goes down here? That's right, Black Manta blasts Shadow Thief with his eye beams, and seemingly rips her in half. I am not one of those folks who complains about the level of violence in comics generally. Forever Evil is a violent series and I'm cool with that. But killing off the new Shadow Thief in such a throwaway bit is very irritating to me. Here was a character who was introduced specifically for the New 52, had a different identity, backstory, gender, and motivation from the previous version. Even the way that her powers were presented was different than what had come before. This was an original take on the concept of the Shadow Thief, which has been around for 50 years at this point. And blam, there she goes, dead as fodder to put over a character who doesn't need any more putting over at this point. I mean, Johns has successfully established Black Manta as a "bad dude" going back to Brightest Day. Does he need to kill a character like Shadow Thief at this point to earn any more "cred?" Talk about a waste. For all the net-marks kvetch and complain about how the New 52 has no diversity and is "just doing the same things over and over," why has the offing of a character which is both diverse and different from what has come before not generated even a peep from the normally breathlessly-offended internet comics community? I know I am going to be shocked (shocked!) when in a year or so, a new new Shadow Thief shows up to fight some iteration of the Justice League, and it's (wait for it) Carl Sands.